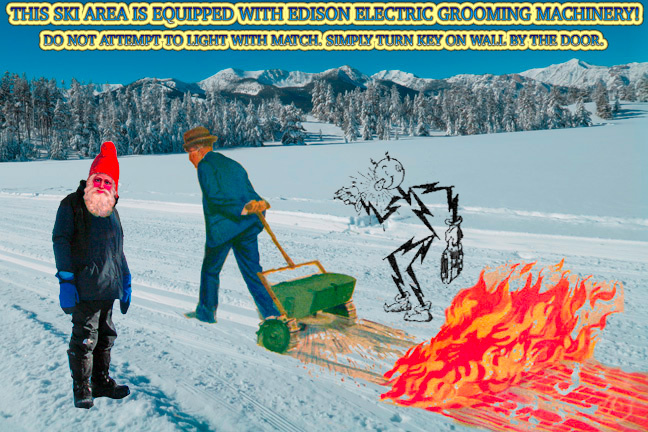 On Sunday, January 27th, 129 years after Thomas Alva Edison received his patent for the electric light bulb, the Alturas groomer was down and out of service with a suspected electrical problem. Davinius, Reddy Kilowatt, and master mechanic and local fire chief Scott are meeting at the scene on Monday to look for loose wires, burnt fuses and melted connections. Your prayers for a divine intervention and a speedy recovery would be greatly appreciated. First man Adam had better luck grooming at Park Creek on Sunday where he touched up trails with no shocking events to report.